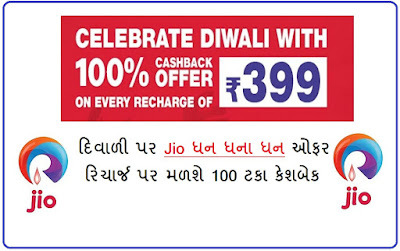 Jio's Latest Diwali Offer: If you recharge your Jio number with the Rs. 399 recharge pack, then you will get eight coupons of Rs. 50 totalling Rs. 400, or a 100% cashback. 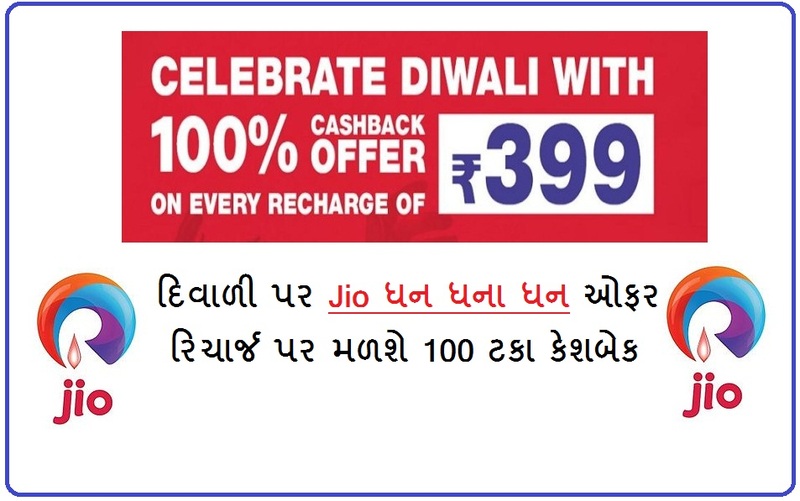 Jio Diwali Dhan Dhan Dhan Cashback Offer: Jio is offering 100% cashback on Rs. 399 recharge plan. These coupons can be redeemed after November 15, on recharge of Rs. 309 or higher denomination recharge pack For example, if you recharge your Jio number with a Rs. 309 pack after November 15, you have to pay Rs. 259 instead of Rs. 309. At one time you can redeem only one voucher of Rs. 50, a Jio customer care executive said. Once you recharge your Jio number with Rs. 399 pack between October 12-18, The coupon will be credited immediately You can see the vouchers under the "My Vouchers" section in your MyJio app. The customer care executive also said that one can gift the coupons to another user by transferring the coupon to their Jio numbers, who can redeem them on their subsequent recharges of Rs. 309 or above after November 15. One can also avail the benefits of the Jio Diwali Dhan Dhan Dhan Offer, even if his current recharge plan is still valid. The Rs. 399 recharge will be lined up and will be activated once the validity of your current plan ends, the company said. The Rs. 399 recharge pack of Reliance Jio offers 1GB data per day at 4G speed for 84 days with unlimited local and STD voice calls, SMS and access to MyJio mobile app. One can buy the Rs. 399 recharge pack during the offer period from Jio.com, from his MyJio app or by retail stores. Reliance Jio also said that its current plans are expected to be revised with effect from October 19. In the revised Rs. 149 plan, after you consume the 2 GB data limit within 28 days, your internet speed will drop to 64 kbps, but you can continue to have internet connection for the rest of your 28-day validity. All vouchers can not be used together. Only one voucher can be used on a recharge. If you recharge 309 rupees, you will have to pay a voucher of Rs 259 for one. Jio recharge can be done by My Jio App, Jio.com, Jio Store Outlet and Reliance Jio Digital. Apart from this, the vouchers can be used by recharging Jio from Online Patiam, Amazon Pay and Mobikweik. This offer of Reliance Jio is only for 84 days. In which the user gets unlimited voice calling and unlimited internet access. Even when roaming, no call charges will be required. 0 Response to "Letest Jio News :The Diwali Gift to Jio Dhan Dhana Dhan Offer 100% Cashback will be Available on Recharge"